The rats just tore the grate open,” Marie Miranda tells me, pointing to a large hole outside her building at 231 East 117th Street in East Harlem. “I see them coming out of there all the time.” The thick metal slab is bent back despite, she said, multiple repairs by the building’s residents. It was late August, and Marie, a 66-year-old former salsa dancer and waitress, and I had just come from a tenants union meeting held in the back offices of Manhattan Legal Services. Eight tenants from 231 East 117th met to discuss strategies for confronting the building’s owner, Emerald Equity, a private equity firm, and doing something about their horrendous living conditions. Emerald Equity and the company it hired to oversee the six-story walkup, ArchRock Management, were harassing undocumented tenants, threatening to call Immigration and Customs Enforcement if they complained, and forcing many to move out. There had been no hot water in the building since Aug. 1, and the gas had been shut off July 1. Some tenants had been without gas for nearly a year — the result of unpermitted construction in seven recently vacated apartments, which workers were converting to luxury homes. The tenants had recently formed a union and filed a lawsuit against 231 E 117 LLC, the limited liability corporation that serves as a shell for Emerald Equity. They discussed a rent strike, seeking rent abatements and how to reach residents of other buildings owned by the company, in the hopes of forming a coalition. In the months that followed, their organizing efforts would provide a glimpse into both the potential of tenant-led struggles against gentrification and the nitty-gritty challenges facing them — at a time when profit-seeking investors are trying to drive out tenants in many of New York City’s 900,000 rent-stabilized apartments. 231 East 117th is one of the 47 East Harlem buildings that comprise the “Dawnay Day portfolio.” They were built between 1900 and 1961. By 1980, when Steven Kessner, the son of a taxi driver from the Bronx, began consolidating the portfolio, white flight, redlining, crime and a drop in city services had led to a sharp decline in property values, and scores of buildings were abandoned. Kessner bought up entire lots at a time. He purchased one lot in 1981 for just $15,500. Most of the apartments in the portfolio were rent-stabilized — a form of rent regulation New York City enacted in 1969, which has since been taken over by the state. Rent-stabilized tenants have the right to renew their lease, can’t be evicted without a legal cause, are exempt from arbitrary rent increases and have the right to form a tenant union. However, their apartments can often be deregulated — often illegally — if they move out, which has led to widespread harassment by landlords. By the time Kessner was done, he owned 47 buildings, housing more than 5,000 people. 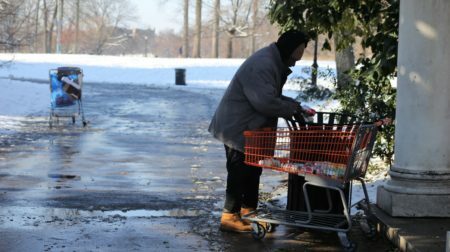 He saw himself as an entrepreneur, but tenants complained of freezing apartments, holes in the floors where rodents could move freely in and out of their homes, and a chronic lack of hot water. Neighborhood groups led by Mexican immigrants and the Movement for Justice in El Barrio, the New York extension of the Zapatista movement, started leading public protests against Kessner and suing him to win rent abatements. In 2007, burdened by numerous lawsuits and bad publicity, and unable to convert the units into high-rent luxury apartments fast enough to keep the portfolio profitable, Kessner sold the buildings to Dawnay Day, a British private equity firm. Dawnay Day paid $225 million for the 47 buildings. They then had 2,149 open violations of the city’s housing code, including lead-based paint hazards and broken windows. Still, it was an attractive investment. The firm planned to replicate a strategy that had been successful for them in London’s Brixton neighborhood, once home to bohemians and Caribbean immigrants: It would push out long-term, low-income tenants and renovate the buildings to deregulate the apartments and attract richer tenants who’d pay higher rents. Dawnay Day began major renovations as a prelude to eventual mass evictions, but the financial crisis intervened. By September 2008, the firm was in bankruptcy. It sold off many of its holdings, including a $34 million Lucian Freud painting and the East Harlem buildings. The purchase price worked out to about $317,000 per unit — relatively cheap by New York standards — but 96 percent of the units were rent-stabilized, with tenants paying well below the potential market rents for the area. Emerald Equity would never see a return on its investment if those people were allowed to stay. The company picked up where its predecessors left off. It charged fees for routine maintenance or ceased performing maintenance at all, and began threatening undocumented tenants with calls to immigration authorities. 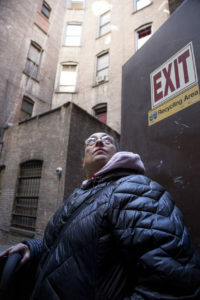 UNAFRAID: “The reason [the landlord] does anything for me is because I got a large mouth,” says Marie Miranda, a tenant leader who has lived at 231 E. 117th Street since 1986. Credit: Isaak Liptzin. Built in 1910, 231 East 117th Street is one of the oldest buildings in the portfolio. Its red-brick facade casts a handsome image over the leafy street between Second and Third Avenues. Inside, the wide marble floors and spacious stairways that connect the building’s 35 apartments were surely once pristine. Now thick construction dust hangs in the air. Zippered plastic coverings, like body bags, shroud residents’ doors — a concession won by the tenants union to prevent the dust from entering apartments. Marie moved to 231 East 117th in 1986, while the building was still owned by Kessner. She recalls those days when drug dealing was rampant in East Harlem and how, more than once, she saw dead bodies squirreled behind the building. She doesn’t dance much anymore, but she still dreams of having a dance studio — not for herself but for her son, who has traveled as a backup dancer with Beyoncé and Missy Elliott. Her daughter is a social worker for Child Protective Services, and Marie often babysits her grandson in the evenings when her daughter has to make house visits. She plans to leave her two-bedroom apartment to her son someday. Before taking me on a tour of her building, Marie cooks me breakfast. I’m the second guest to visit her apartment in 15 years; the first was Alex Nicoll, her socialist upstairs neighbor. Her cat, Oreo, joins us. Marie is allergic to cats, but said she would rather live with a cat than the rats. She credits Oreo with keeping the vermin out of her apartment. She trained him to jump up through a hole in the wall to her son’s bedroom when she calls his name. Some tenants had cautioned me about Marie. They said that she was loud and opinionated and could be somewhat abrasive. She didn’t disagree. Her loud nature is a source of pride and an emotional tool that she has used against her landlord. On July 1, when the gas went off for the entire building, Marie started to collect cellphone numbers of people in the building and looped them into a group chat on WhatsApp. She and another tenant went to Manhattan Legal Services to ask them to intervene. At a Sept. 28 town hall meeting in East Harlem, Marie got a chance to tell Mayor Bill de Blasio about her and her neighbors’ plight. The mayor said that officials from the Department of Buildings wouldn’t leave without talking to her. The next morning, inspectors from the department visited 231 East 117th St. and issued fines against Emerald Equity for the illegal construction. Marie and her neighbors celebrated, but didn’t stop making plans to keep organizing. 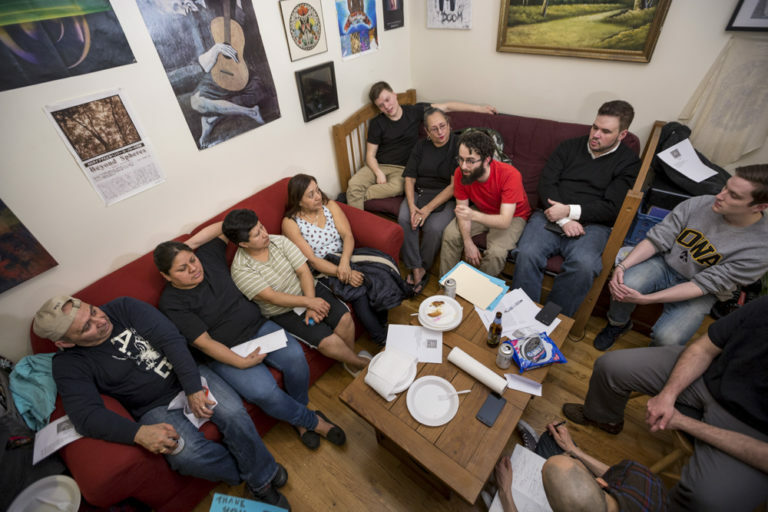 In September, three weeks after their first meeting at Manhattan Legal Services, the 231 East 117th tenants union met again, crowding into 4E, Alex Nicoll’s place. 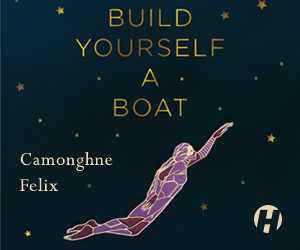 Alex, originally from a bedroom community in Connecticut, moved into the building after graduating from Boston College with a degree in English and significant student loan debt. He took an entry-level job as a recruiter at a prominent financial firm, and moved into the East Harlem building with his cousin John. Rents in the building vary widely. Marie Miranda pays $840 a month. One newer tenant pays $2,200 for an apartment with the same floor plan. She is undocumented and shares it with 10 other people, including four small children. Alex and his two roommates pay nearly $3,000. A few months after he moved in, their living room ceiling collapsed. No one was injured, and repairs were made quickly. Alex was relieved. But when he mentioned the incident to some of his neighbors, he learned that he was not the only one in the building whose ceiling had fallen in. More distressingly, he was the only one whose ceiling had been promptly fixed. Other tenants had had to wait weeks and even months. 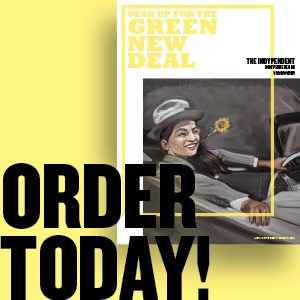 Alex started talking more frequently with the other tenants and met Marie Miranda, whom he described as the building’s “connective tissue.” He also got in touch with the Democratic Socialists of America (DSA). Like many young people who were inspired by Bernie Sanders’ presidential campaign, Alex joined DSA after the 2017 inauguration of Donald Trump. He paid dues but was not an active member. As conditions in his building grew worse, though, he turned to the organization for help. DSA members provided the knowledge and expertise that Alex and his fellow tenants needed. Lawyers at Manhattan Legal Services didn’t have time to teach tenants about the intricacies of rent-stabilization law, but the socialists did. That night in September, 30 people packed into Alex’s apartment. He served strong home-brewed beer. Marie offered guests pasta shells stuffed with ricotta cheese. Spirits were high, but as the meeting was about to begin, the sound of a loud scream filled the building. People streamed out to see what was happening. On the first floor, several tenants were contending with a rat. It was enormous and not scared of humans; ArchRock Management hadn’t provided any extermination services, despite numerous requests. The rat had dropped down several stories and jumped onto the pant leg of a tenant, who shook it off and chased it out of the building. As the meeting resumed, a disagreement broke out that was trivial to some and crucial to others. As a temporary solution to the lack of gas, management had installed cheap electric stoves. Florencia Aguilar, from 4D, said the concession was granted too easily. She’d joined the tenant union over the issue of the gas, and thought the electric stoves would just be a temporary fix. She prefers cooking with gas, and worried about an increase in her monthly electric bill. She and several other female tenants threatened to leave the union if their concerns were not taken into consideration. But now that the stoves had been installed, it was difficult for the union to backtrack. Few sounds on earth are weaker than the feeble voice of one, so forming a tenants association greatly improves your chances of winning better conditions in your building. You can either do it on your own or with the aid of a community group such as the Crown Heights Tenant Union, Flatbush Tenants Coalition, CASA in the Bronx or the Cooper Square Committee in Manhattan — who can also connect you with other people in the neighborhood facing similar problems or have the same landlord. The rent strike is a time-honored tactic, as it hits the landlord in the pocketbook. You tell your landlord that you are withholding all or part of your rent until there is adequate heat, broken windows are fixed, or whatever. You can also file an “HP action” demand that Housing Court order repairs, and try to win a rent abatement for the time you had these problems. Rent strikes are legally risky, however, as refusing to pay rent will almost certainly get you an eviction notice. It is a good idea to put your rent money in escrow, so the court knows you have it. Having a lawyer greatly increases your chances of success. Computer technology has greatly increased the risks. As Housing Court cases are public records, companies have amassed lists of the tenants involved and sold them to landlords, who use them to blacklist suspected deadbeats and troublemakers. The state Office of Court Administration stopped selling individuals’ names in 2012, but it continues to provide a daily electronic feed of information on pending cases — and “it’s not hard” to match the case’s index number to the tenant’s name, lawyer Jamie Fishman said at the time. The argument underscored an uneasy boundary between Alex and his neighbors, which he and the DSA as an organization are struggling with. DSA is mostly white and majority-male. Its young, college-educated members are largely disconnected from the working-class communities of color they seek to empower. Their budget constraints are real, but they do not have the same stakes in the community as longtime residents. Here in East Harlem, DSA members are learning how to organize in spaces where the strongest protagonists are working-class women who often provide for their families through the use of their stoves. Those women were concerned that cooking on an electric stove is more expensive, and that they can’t turn the heat up or down quickly. They also fretted that their children would singe their hands if they touched the hot coils on the burners. “To me, the issue of the stoves didn’t make much difference, but it’s also certainly a gendered thing,” Alex later reflected. Walking through the building with Marie one day later in the fall, I perceived the unmistakable smell of burnt nopal cactus. We peered through an open apartment door, where two Hispanic women were wrestling with a smoking comal (a Mexican-style griddle) on the stove. Although outrage over the electric stoves has subsided, not everyone has gotten used to them. That same day, Marie and I also managed to enter 5D, one of the empty units at the center of all the illegal construction. The door was open, the recessed lighting on. It was lunchtime, and the construction workers had left their gear leaning against the wall. The living room and one bedroom had been enlarged and divided into a dining area and kitchen, with mauve walls and grey wood floors. The kitchen was equipped with stainless-steel appliances, including a dishwasher and an enormous black glass-top oven. There was a separate cabinet with a washer and a dryer, and the bathroom had a modern toilet and a new shower stall with a glass door. It was another world compared with the other apartments in the building. Alex Nicoll started the Dec. 10 tenant union meeting by reading a chapter in Howard Zinn’s A People’s History of the United States about tenant uprisings in the Hudson Valley in the 1830s. As he read in English from his laptop screen, a neighbor uneasily translated the dense text about a showdown between a sheriff and his mounted posse of 500 against 1,800 tenant farmers who refused to pay rent. Olga later told the group that many Hispanic tenants have not joined the union due to either a miscommunication or a misunderstanding about who can take part. They said that Johnson Atkinson, the lawyer from Manhattan Legal Services who is representing them in their suit against Emerald Equity and ArchRock Management, told them they needed a Social Security number in order to be a client. “He said to me: ‘I only defend legal people,’” Olga said. Another Hispanic tenant confirmed Olga’s account. This was met by dismay from the other tenants. Atkinson did not return multiple requests for comment. The tenants agreed to set the record straight both with Atkinson, and with the Spanish-speaking tenants reluctant to participate in the union. You don’t have to be a citizen or have a green card to join a tenants’ union or take part in a rent strike. Landlords are bound by leases regardless of their tenants’ immigration status. “You mean I can tell my people they can come to the meetings?” Olga whispered to Marie in Spanish. Next on the agenda was the issue of nonpayment notices. All of the tenants involved in the rent strike had received calls in the last week threatening them with eviction if they did not pay up. Several tenants voiced their commitment to remaining on strike. It would give their lawsuit for repairs more leverage. Others wavered. “I don’t necessarily want a nonpayment notice on my record,” said Alex. The tenants agreed to postpone their decision. There was a more pressing item on the agenda. Marie had complained to ArchRock that the building’s porter was not taking out the garbage or cleaning the halls, and that she suspected him of dealing drugs across the street. In the hallway outside her home, he’d told her she had better watch her back. No one in the tenant union trusts the police to help. The union instead appealed to the DSA to provide Marie with volunteer escorts while she walks home from her daughter’s place late at night. On Jan. 28, Marie Miranda cooked potato salad, pastelillos and rice for a group of 30 socialists and Emerald Equity tenants gathered in Alex’s apartment for the DSA Housing Working Group meeting. The socialists came to hear the tenants’ experiences, and tenants came to give powerful testimony of landlord abuse. There was standing room only as people crowded into the living room and leaned in from the kitchen to hear the tenants speak. One by one, in Spanish, the tenants gave harrowing accounts of abuses spanning decades, including the death of one tenant’s father due to management’s negligence, lease renewal notices sent late, irregularities in rent histories, bathrooms without working sinks, mold and mildew, infestations of cockroaches and bedbugs, and the most recent eight-month period of construction, when ceilings collapsed pipes burst and tenants were frequently left without basic services. Tenants also voiced frustration at the pace and limitations of the lawsuit. Lawsuits move slowly, and while progress is being made on getting rent abatements for several of the most affected tenants, cockroaches infest many of the apartments. The super was away in Venezuela, so no one was cleaning the building. In December, the Fire Department was called when an electric stove caught fire. On Jan. 24, the hot water went out in the whole building after a pipe burst in one of the newly renovated — and now rented-out — apartments. Emerald Equity, ArchRock Management and Brookfield Property did not respond to requests for comment. A letter from Con Edison shows that the owners owe $10,000 in electric bills. The Buildings Department issued seven Environmental Control Board violations in September, which are still outstanding. No one from the landlord showed up at the hearing to dispute the violations, and the unpaid fines now total $10,580. There is a stop-work order posted on the front door of the building. 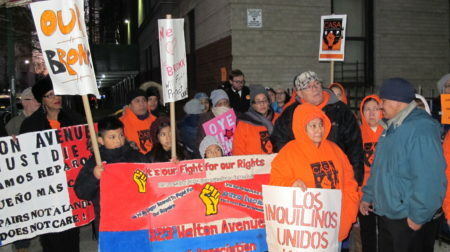 Meanwhile, in December the City Council approved a de Blasio-backed rezoning plan for East Harlem that will allow for the construction of high-rise towers. The new market-rate apartments coming are expected to greatly increase the gentrification pressures in the neighborhood. Photo (top): GETTING ORGANIZED: Longtime residents of 231 E. 117th St. and members of the Democratic Socialists of America meet and strategize after a shared dinner of cooked potato salad, pastelillos and rice. Credit: Isaak Liptzin.